Are you a client or graduate of the Skills Training Advancement for Refugees (STAR) project? If yes, we need your help. The STAR project is conducting an evaluation and we need your participation to help us better understand the impacts and benefits the project had for participants. Please click on one of the links below – depending upon the type of training your took – to start the survey. Thank you very much in advance for your participation! 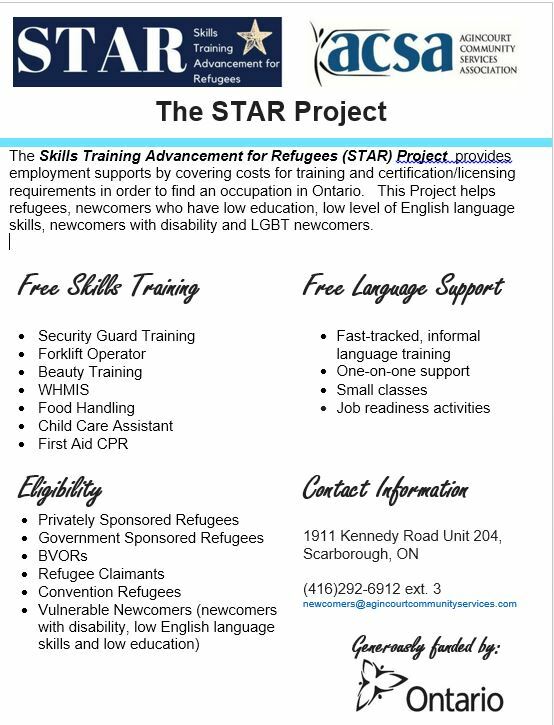 The project, Skills Training Advancement for Refugees (STAR), is funded by the Province of Ontario under the Settlement and Integration Services for Refugees and Vulnerable Newcomers, which seeks to enhance the settlement and employment supports available to refugees (private sponsored refugees, government sponsored refugees, BVORs, Conventnion refugees, Refugee claimants) and vulnerable newcomers (newcomers who have low education, low level of English language skills, LGBTQ+ and newcomers with disability) to facilitate their social and/or economic integration. Coaching and job retention: Develop coaching and mentoring models that help new hires build the skills and work habits required for long-term success in their new work environment. Wrap-around supports: Provide complementary supports that maximize opportunities for success, including childcare, transportation and interpretation. Other vulnerable newcomers with vulnerabilities such as high health or mental health needs, mobility and other disabilities, and low education and official language fluency.